Iceland MTB scene is young and mtb trail access will be limited if riders do not bike responsibly. Off trail riding is illegal in Iceland and can result in heavy fines. Iceland highlands have been kept unspoiled and should remain intact for future generations. The extremely short highland summer of 6 weeks gives vegetation a very limited time to grow and recover from damage. Treat nature with respect: Ride only on trails that can support mountain bike riding. Ride on the trail only. 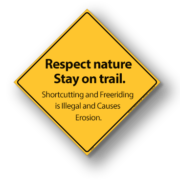 Be respectful and considerate to other trail users. Ride responsibly, don’t cut switchbacks & ride within your limits. Be a model for other mountain bike riders. Pass the knowledge of responsible riding onto your fellow riders. Every rider has the power to shape the future of the sport. The way we ride today shapes mtb access in the future. Keep trails open by riding responsibly.